I did a previous tutorial on how to make chocolate covered gummy bears. 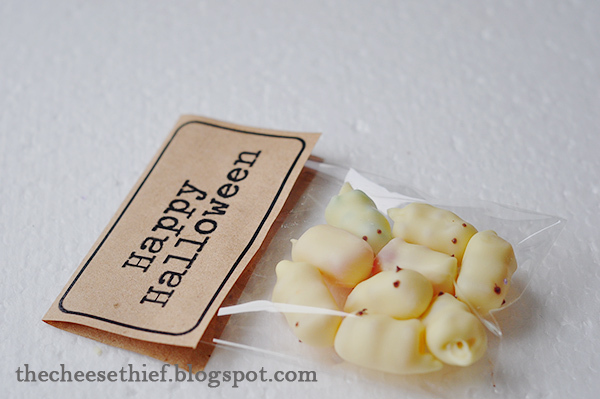 In the spirit of Halloween, I used white chocolate for the body and dark chocolate for the eyes to make ghostly chocolate covered gummy bears. I'm actually not a fan of white chocolate, but my sister loves it. I decided to make her a batch of these ghostly gummy bears. Trader Joe's carries a white chocolate bar that claims to me more chocolaty than regular white chocolate. I decided to give it a try. While it is not as good as dark chocolate, it actually tastes more like chocolate than other white chocolates. White chocolate is harder to work with because it melts at a lower temperature so you can burn it if you are not careful. When heating any chocolate for melting/dipping, over heating will destroy your chocolate. I usually melt chocolate in a mug (so that it retains the heat) in the microwave (easier clean up). 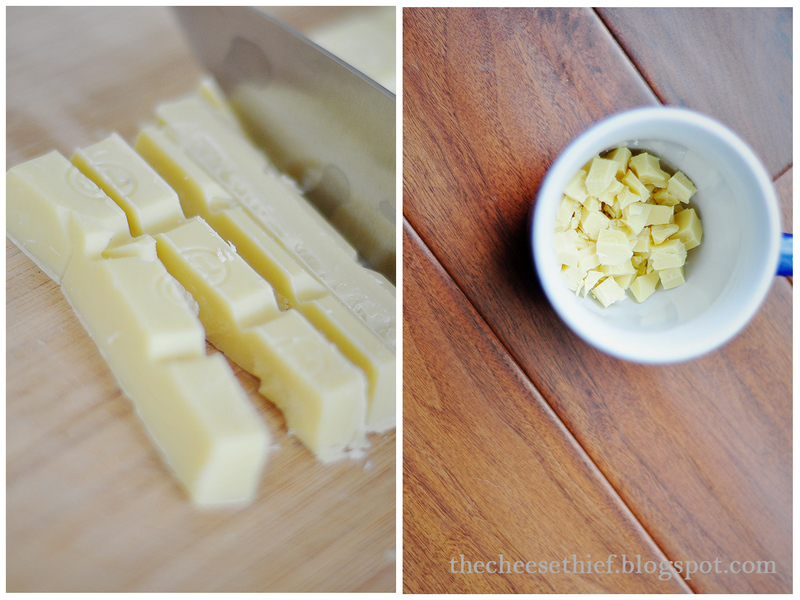 For white chocolate, set the power to 5 and melt in 10 to 15 second intervals. If the chocolate comes out melted, it is probably already burnt. You want to heat it just to the point where when you start stirring, it comes together. It took me only 30 seconds of heating to melt this white chocolate. You do not need to add butter or shortening to this recipe, just straight chocolate, because white chocolate seems to be runnier. 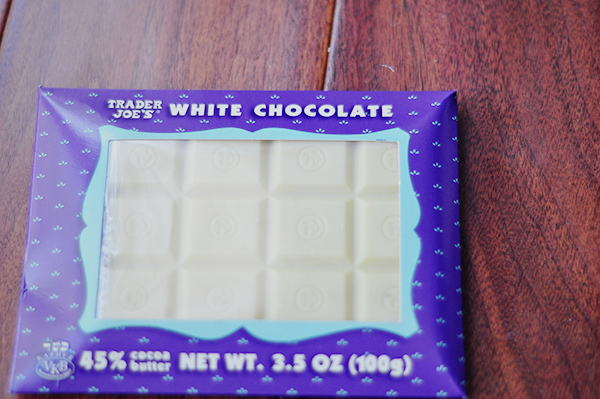 White Chocolate from Trader Joe's. It is better than most white chocolates out there. Cut chocolate into equal sized chunks for even melting. Pop in microwave for 15 seconds at power of 5. Take out and stir. If chocolate seems too hard then pop back in for 10 seconds at power of 5. Melted white chocolate after a lot of stirring. 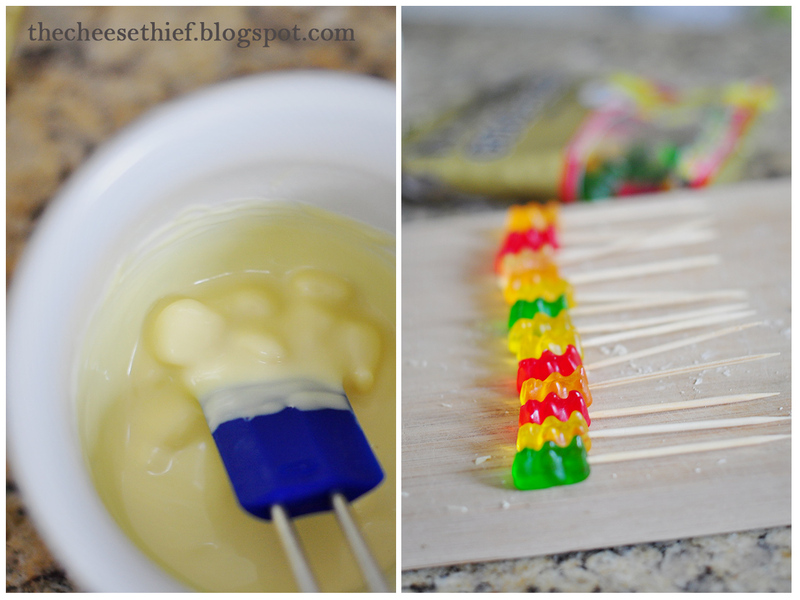 Skewer gummy bears for dipping with toothpicks. Dip gummy bears into chocolate. Wait for them to dry. Then melt a little dark chocolate and using a toothpick, paint the eyes. You could also use those edible ink pens to draw eyes. love those!! stopping by for the blog hop. now following! thanks for dropping by! 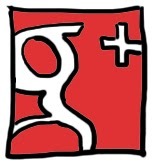 I'm following u on GFC now :) lovely profile pic btw.. These are SO stinking cute!!!!! these look amazing! Thanks for stopping by Mamas Like Me :) Following you now! 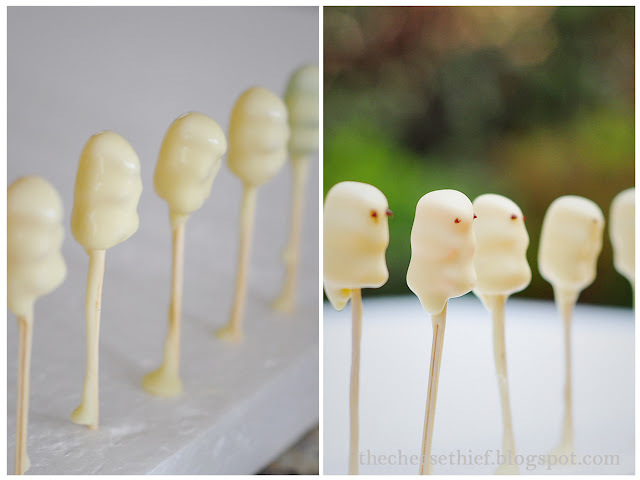 I have never made chocolate covered gummy bears but they sound really really good! I think I'm going to have to try them. I'm more of a dark chocolate fan as well. Stopping by from the Give a Hoot Blog Hop! I'm a new follower from the Wed Blog Hop. I'd love for you to stop by my blog and follow back if you like! So, so SO cute!! I love this idea. Thanks for sharing! These are so cute. New follower from the blog hop. You creative girl! =) & I like how you packaged them to. Totally going to lift this idea from you! Omigoodness! TOO, not to! Argh! Can't believe I did that!! oh my goodness... this is nuts!! I love how simple that is! Aww this is a wonderful site you have here.I love all the candy pictures! omg i so want to try this! Thanks for stopping by. I'm glad you did because I love all these cute ideas you have on here. I can't wait for more. I'm a new follower. That is a brilliant idea!! I have a wedding shower coming up (I'm planning it) and I like the idea of chocolate covered anything! I'm a new follower from Thoughtful Thursdays! 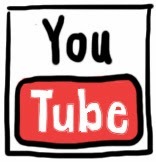 I hope you'll follow thenewglasers.com - I have a new post up about gratitude and thankfulness (it's a giveaway, too!) - I can't wait to read more! OMG these are adorable and such a great idea! Thanks for your lovely comment from the followers fest. I'm completely won over by these chocolate gummy bears - what a brilliant idea!! Aw, these look SO cute!! Love these! Awesome idea, and they look so cute! I'm going to have to try this right now! Thanks for the great step by step photos! Seriously adorable! 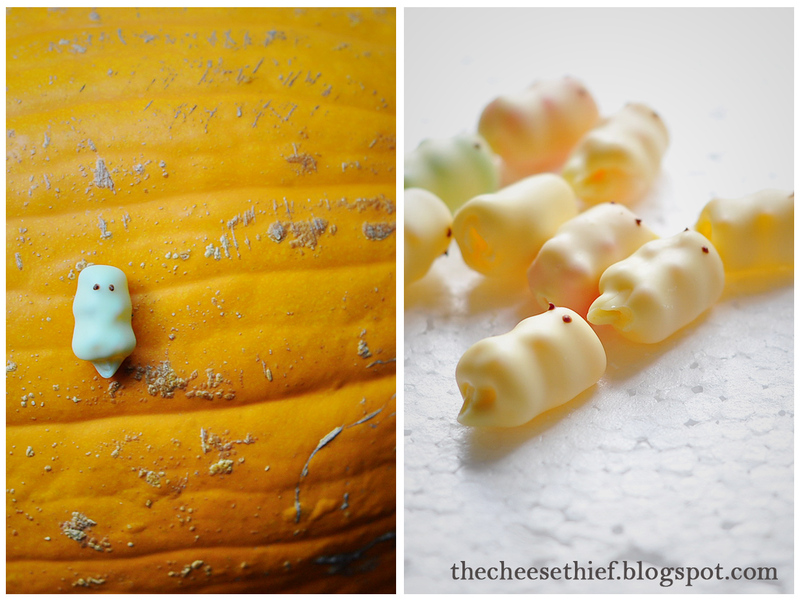 I am going to link to them in my upcoming Halloween Recipes post!